Before you suggest there’s no way vegan biscuits can taste just as good if not BETTER than regular biscuits, everyone I’ve fed these to agree that these are in fact LEGIT, amazing, fluffy, buttery biscuits. As in, serve them to your 80-year old grandmother who’s been making biscuits for centuries and she wouldn’t know the difference. As in, slap some gravy on it and you’d think you died and gone to heaven. 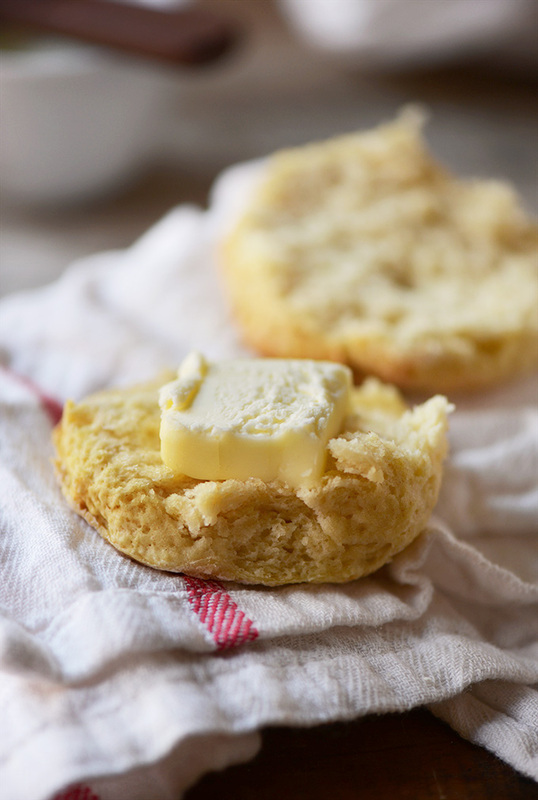 As in, fluffy, buttery, savory, biscuit perfection. It’s true. I have tried making vegan biscuits once before and they did not meet my ridiculously high biscuit standards. They lacked that quintessential buttery flavor and fluffy texture that I so deeply adore. So this time, I read every single tip out there to fail-proof my biscuit making. And I’m happy to report that IT WORKED. 2. Non-dairy butter (such as Earth Balance). That’s it! And you’re well on your way to vegan biscuit perfection. 1. Do not over-handle the dough. 2. Never use a rolling pin, fool. 3. Make sure yo’ butter is cold. 4. Baking powder and soda are a must for fluff. 5. Brush the tops with butter to achieve that crusty, buttery top. 7. A hot oven (450 degrees F / 232 C) is essential. Don’t ask questions. 8. Biscuits must touch while baking to help them rise properly. I would include a # 9. but it’s simply to eat biscuits immediately. I shouldn’t have to tell you that. A BISCUIT FRESH OUT OF THE OVEN > A BISCUIT REHEATED 3 DAYS LATER. Duh. These little guys are PERFECT. 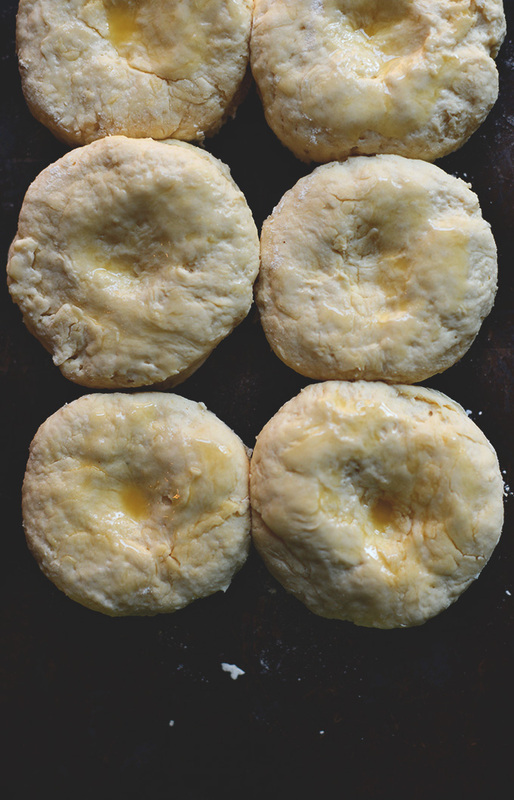 Fluffy, moist, buttery, savory, perfect with jam, perfect for breakfast, perfect with anything. Hence the reason I’ve dubbed them THE BEST DAMN VEGAN BISCUIT. And yes, I totally ate that whole damn biscuit (and them some). 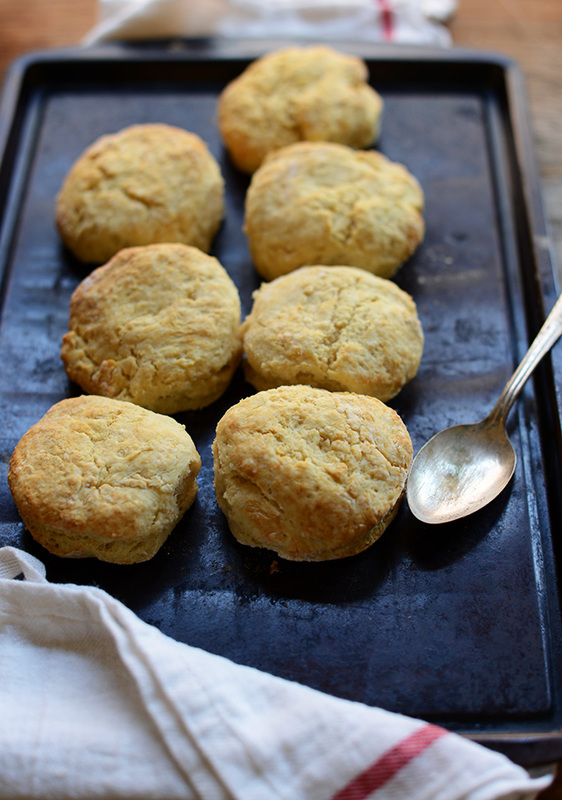 Fluffy, buttery vegan biscuits that require just 30 minutes, 7 ingredients, and 1 bowl! Perfect for breakfast as is or smothered with jam! Preheat oven to 450 degrees F (232 C), and add lemon juice to almond milk to make "vegan buttermilk." Set aside. In a large mixing bowl, whisk together dry ingredients. Add cold butter and use fingers or a pastry cutter to combine the two until only small pieces remain and it looks like sand. Work quickly so the butter doesn’t get too warm. Make a well in the dry ingredients and, using a wooden spoon, stir gently while pouring in the almond milk mixture (vegan buttermilk) 1/4 cup at a time. You may not need all of it. Stir until just slightly combined – it will be sticky. Use a 1-inch thick dough cutter or a similar-shape object with sharp edges (such as a cocktail shaker) and push straight down through the dough, then slightly twist. Repeat and place biscuits on a baking sheet in two rows, making sure they just touch – this will help them rise uniformly. Gently reform the dough and cut out one or two more biscuits – you should have 7-8 (as original recipe is written). Bake for 10-15 minutes or until fluffy and slightly golden brown. Serve immediately. Let remaining biscuits cool completely before storing them in an airtight container or bag. *Adapted from the man, Alton Brown. Anyway to have these stay awesome and make them gluten free too? I made this last night and tripled the recipe, which may have been an over-reach for my first time making bisquits (well, other than using Bisquick in the past)! I used unsweetened Almond milk (Silk), and Miyoko’s Vegan butter (Trader Joes, $4.99). I think I overworked the dough a bit because it was tough with a big batch to get it all mixed together (6 Cups of unbleached flour). HOWEVER, aside from being dense and a bit heavy (maybe they are even if you don’t over-do the dough? )…They are great! VERY tasty and for me they totally satisfy the traditional bisquit craving. They might “feel” like hockey puck…haha…but they are soft and moist on the inside. I did not use a full 3 Cups of the Almond milk (as suggested by previous users). I am bringing them to a potluck tonight so I will try to report back the consensus, but I would def make these again. Thank you! I was stuck, vegan guest for afternoon tea, what to do???? Googled vegan biscuits came across this recipe, I know them as scones, tried them without changing anything and they were a delight to behold. Tasted yummy. Next time I will use only 3/4 cup of milk. Thank you for the tip on making “buttermilk”. I will use this often also the recipe. Absolutely delicious. I use unsweetened Cashew milk in place of almond, and it also works well. Biscuits are so soft and delicious, and good at any size — a few big biscuits, or a ton of one-bite biscuits. Great recipe, all time favourite. Best recipe ever! My go to recipe! Easy, quick, tender and flaky! These freeze and reheat fabulously! What a great recipe! I’ve just made lovely looking and delicious tasting biscuits in no time at all! I am planning to use coconut milk in stead of almond milk .. also can k substitute dairy free butter with either peanut butter or coocbut oil. Other readers have had success with chilled coconut oil. Hope that helps! Thanks for this amazing recipe. I made this for breakfast and didn’t tell anyone it was vegan. They were in disbelief after tasting! I did make the mistake first time of using self rising flour (already has salt, yeast, and baking soda), so they were extra salty. Definitely didn’t make that mistake the next time! I love this website and share it with all my friends. OMG, so in love! I’m a newbie with vegan food and I truly enjoyed making this. In fact, tonight was the second time that I made them and they were perfect. I shared the first batch with my colleagues. They were super impressed that they were vegan and how delicious they were. Thank you so much and I look forward to exploring more recipes here:). Swapped the salt for a couple tbsp of sugar, and added chopped frozen fruit… scones! Delicious! I did substitute lemon for apple cider vinegar. I also did not have almond milk so I used coconut milk in a can. Thank you for all the great tips! Goodness, I make all of these mistakes! I am so excited to try out your recipe, nudge my biscuits, and let them be close friends in the oven! I have made these a bunch of times and I love them! however, mine come out a little miss shaped and a little too crumbly to cut open and place stuff on the inside of. I love a crumbly biscuit and eat them plain any ways but my husband (not vegan) likes to put eggs on his. What am I doing wrong/ how can I alter it to look like yours? Hi Heather, so glad you are enjoying this recipe! We would suggest playing around with adding a little more almond milk (starting with just a splash) to see if that helps make them less crumbly. Keep us posted! I made these with flax milk and real butter and they turned out great! Thanks for sharing! Amazing! I used real butter since I’m not fully vegan and vegan butter is expensive, and they turned out great! I found out that baking powder is just 2 parts cream of tartar, 1 part baking soda. So, 2 tsp cream of tartar and 1 tsp baking soda makes the 1 tbsp baking powder for this recipe! I used bobs red mill all purpose flour and followed the recipe to a T. The vegan buttermilk seems to be way too much for this recipe. Not sure if I should have just used 3/4 cup? I’m not an experienced dough maker or baker in general, so I actually didn’t know when to stop. I see your instructions say “you may not need all of it” but there was nothing helpful about what to look out for (though it might be obvious for some). I ended up with a pile of wet “dough” that was not foldable. I ended up putting it in a pyrex and cooked it like like cornbread instead haha. It wasn’t nearly as good as biscuits but was still edible. Ok – the first time I made this recipe the biscuits were OUT OF THIS WORLD!! So so good. Ever since though, every time I try to make them they come out with a strange, bitter aftertaste. I feel like haven’t changed anything about the way I was making them, and followed the recipe to a T. What could I be doing wrong? Is anyone else experiencing this? Hi Emily! Chemical leavening agents like baking powder can leave a bitter taste, especially when using too much! Try using less next time and see if it makes a difference. Thanks! I’ll give that try. PS I love your blog! So grateful for a place to find quality vegan recipes. Really delicious biscuits! So much for lasting for days in an airtight container…they didn’t even last 30 minutes between me and my husband 😳 They went great with the gravy or with jam. I only used about 3/4 cup of the buttermilk and I rolled them out a bit too thin so they were much smaller than yours and I only cooked them 10 minutes. Smaller just meant we ate more though! Hi, for this recipe am I able to use a gluten free flour mix in replace of the unbleached flour it calls for. Like the gluten free recipe you have in your vegan apple cider donuts? Hi Leandra! 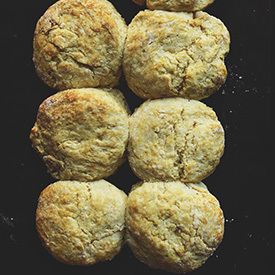 You may be interested in this gluten-free biscuit recipe! These turned out beautifully with Bob’s 1 to 1 gluten-free flour (light blue package). I didn’t change anything. Just baked them about 5 extra minutes, so for a total of 20 minutes. Is there a trick to making gluten-free baked goods get golden brown? The first part of step 8 should facilitate browning. It might depend on the brand of non-dairy butter that is used. We have had success with Miyokos and Earth balance previously. Hope this helps! I feel gluten-free flours must have a specific property/characteristic that doesn’t allow them to brown. If anyone is reading this and has an answer for me, please let me know! My daughter and I are self-proclaimed biscuit connoisseurs and this recipe was absolutely perfect! Melt-in-your-mouth, fluffy, golden brown and delicious. You nailed it! Thank you for a wonderful recipe. 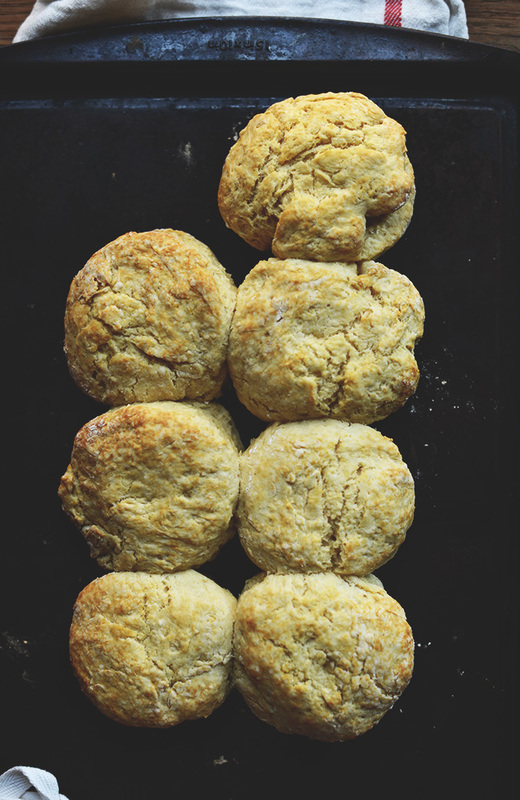 It’s now our #1 go-to vegan biscuit recipe. Yay! We’re so glad to hear that, Suzie! I’ve made these 3 times now, the first time they came out perfect and amazing. The second time I didn’t need as much of the “buttermilk” and accidentally added all of it so they were just liquid-y and mush. I made them again today for the 3rd time and they’re perfect again. I love these biscuits and they’re very easy and quick to make. I always substitue the lemon juice for apple cider vinegar, works like a charm. I make these biscuits all the time, they work great in any context, from strawberry chortcake to biscuits & gravy! Thanks Minmalist Baker!! A tip for anyone who avoids working with dough like the plague – put parchment paper under your floured surface. I’ve made these many times (because they taste so wonderful!) but had difficulties every time with the dough sticking to my surface. This may be common knowledge and I’m over here acting like I discovered a new planet, but I was so happy I tried this. Thanks for this great tip Sara! I will try this next time. I have a lemon allergy can I just leave it out or substitute it with something else ? I made them and used apple cider viniger instead! They came out great!!! I doubled the recipe, froze them and baked them the next day at 425 for 15 minutes and they were perfect!!!!! Definitely the best damn vegan biscuits. These are the best damn biscuits. Vegan or not. I’ve made these now twice. The first time around I followed the recipe exactly. The only complaint I had is that there was an aftertaste of the baking powder. The second time I made these I cut back on the baking powder slightly. I also didn’t have any lemons so I used lime to make the buttermilk. This turned out absolutely delicious. Thanks!! These are by far the most amazing biscuits and they are adequately named! I actually made them two days in a row. I did substitute equal parts ACV for the lemon juice and instead of almond milk (b/c of family allergies) used a blend of Ripple Milk and Coconut milk. These were PERFECTION right out of the oven. I’ve been following you for a while and as I am a self-proclaimed “non-baker”, am sad I didn’t try these sooner! Whoop! Thanks for sharing, Jay! I’ve never made biscuits from scratch before, but I’m glad I tried these. I found the dough QUITE sticky and a bit difficult to manipulate, but with patience I managed a batch of 10 successful biscuits! I baked them the full 15 min, and my carnivorous husband enjoyed them as well. Thank you Dana for making my recently new vegan kitchen a manageable place to cook and bake! I literally just posted a tip about this…. I too have always been challenged with the stickiness (and lacked the patience that you see to have!). Put parchment paper down and work on that with the dusting of flour. Game changer. It is cold tonight and we made vegan biscuits and vegan gravy … you biscuit recipe was on point. Hi. Loved that the biscuits looked like biscuits and had a great texture. The one downside was the after taste that I believe comes from either the amount of baking soda or powder. Do you have any solutions to get rid of the aftertaste? I followed the recipe (no substitutions). I found the same thing. I cut back to about 3/4 tablespoon of baking powder instead of the full tablespoon. This did the trick for me. My holiday mornings were so pleasurable this year because of these biscuits!! WOW am I impressed and tickled that I can have yummy biscuits again. For Christmas morning I found this recipe by googling “vegan biscuits” and substituted Pamelas All Purpose Gluten Free flour for my needs. I don’t use Earth Balance butters bc of the canola oil but did find Miyokos which is a new discovery for me and worked great! Today, New Year’s Day, I made them again (great again) but see the updated gluten free recipe and will try that next time. SO HAPPY, THANK YOU!! I tried this recipe and am so disappointed :( first I tried 1 1/2ing it (instead of doubling) and it was horribly bitter, so I tried again using the recipe as is, 1 serving, and I was still so out of control bitter I can’t get the taste out of my mouth lol. I just made focaccia bread two nughts ago, not a seriously different recipe, so unsure what the issue is?? Too much baking soda or powder?? Any thoughts? It sounds like you’ve miscalculated the amount of baking powder or soda as it shouldn’t taste bitter.. Sorry to hear it didn’t go well for you! You’ve done it again! These biscuits are perfect and delicious! I made them tonight to go with the leftover Thyme and White Bean pot pie filling. Two great recipes collide. I asked my husband to buy vegan butter and recommended Earth Balance. He came home with the spreadable variety, not the sticks. Will that work, or should I just use the coconut oil recipe instead? Thanks so much! Hmm we haven’t tried using the spreadable kind, so I’m not sure if you’d get the same results. I know that others have had success with coconut oil, so that is probably your best bet! I use the spreadable kind because I have had a hard time finding the sticks. I assume they’re always sold out before I get to them! I currently have the whipped spreadable and it’s worked just fine, no noticeable difference. I made this recipe for the first time today. They are so delicious, as is everything on this site! My one issue: the biscuits didn’t brown up. I did brush on vegan butter before baking, but they never really got brown – only the bottoms turned a little brown. Thanks for all of your amazing recipes!! Made a small batch of these for Thanksgiving and they were incredible! I had never made biscuits before, so I was a little worried, but I followed all of the (super helpful) tips and they turned out even better than I was expecting. They even impressed my non-vegan relatives, who requested that I make multiple batches for Christmas. Very quick to make and super delicious – I’d give a 6 star rating if I could! My comment is specifically to do with freezing the dough to bake later. I saw several comments asking about this, but I may have missed it if someone already tried it and reported on it. I made a batch (8 biscuits) and immediately baked 4 and froze the other 4 for about 36 hours. The freshly baked ones were phenomenal!! The recipe is perfect and so easy. I was sooooo very pleased when I baked the frozen ones 36 hours later and they were also perfect!! There was not a bit of difference in rise, taste, or texture. My fresh batch was done after 10 minutes. My frozen batch was cooked directly from frozen (no thawing, although I did brush some Earth balance over the top right before popping in the oven) at 450 F and took 15 minutes. Hope this helps anyone who was wondering about freezing! Just a killer recipe! Okay so I just made these, gluten free! I used coconut oil instead of butter as well! I used a pre-made mix from arrowhead mills all purpose gluten free flour. It does have tapioca in it, so I think it made them slightly gummy. Otherwise..they are delicious! They fluffed up quite well and turned golden. Going to use them to make some mini pot pies. I made these today for a special treat for me and my sweetie. They were amazing! We are having a romantic get away so I had to improvise with oat milk and vinegar substitution but I would challenge anyone to tell me that they are not made with dairy! Hi there! I’m not an experienced baker by any means but i’ve been following you minimalist recipe’s since I went plant based back in August and I LOVE what you’re cooking up. The one edit I was hoping to suggest is changing out the wording in step 4 when you say “pouring in the almond milk mixture” to “pouring in the VEGAN BUTTERMILK mixture…” I prepped the vegan buttermilk and forgot to take it out of the fridge when I started making everything because the terminology wasn’t the same. They still turned out well! I also used GF flour so they’re a bit heavier but not bad. Sad I missed out on the fresh squeezed lemon. Oh shoot! Thanks for sharing! I’ll see if we can clarify the wording on that. OMG. I have always been terrified of making biscuits, afraid that they would turn out dense or flavorless. These are amazing, and the tips you shared helped me make my first ever batch PERFECT. I used unsweetened cashew milk and earth balance…. I might need to make a second batch while I demolish these… and might need to order some bigger pants… thank you! LOL! I was thinking the same thing :) I was always afraid of making biscuits too, I hate wasting food and I thought for sure I would just make a mess of this….But Dana’s step by step and do’s and don’t made it seem just like something I could handle. I too used the unsweetened cashew milk. They turned out perfect. Do you know if these would do well to make ahead of time, freeze, and then bake just before they’re needed? I’d like to make them for thanksgiving, and will be driving nearly two hours. If possible, I’d like to stick them in the oven when I arrive so they can be hot. Thoughts? I don’t know about freezing these, but you could always make them ahead and store them in an airtight container or bag. So, I’m definitely making these for Thanksgiving, but do these freeze well? I’d love to make them in advance if I could! And if so, what would be the adjustment for cooking time? Loved the texture and flavor of these biscuits! Wonder what diameter biscuit cutter to use, however. Mine needed a bit more baking time so I thought perhaps the 3 inch cutter I use was too big. The directions only specify a biscuit cutter that is 1 inch thick. Thanks! I’ve made these before when I made the vegan pot pie, they are that amazing! I’m going to make them for my (non-vegan) family at Thanksgiving and they’ll never know! Ya know what I’m just gonna try it and pray for the best! P.S. I was short on time so I just spooned clumps of the dough onto the pan and they were still awesome. Yay! Thanks for sharing, Kirt! Hi, I’m new to biscuit making and was wondering where I could find a 1″ thick dough cutter? Most of the ones I’ve seen are quite a bit bigger, around 3″. Very good! Tastes like my grandmother’s biscuits. I only had vanilla flavored Almond milk, but the biscuits were not sweetened by the vanilla – just added a little flavor but not much. I also used unsalted organic butter. They were flaky and I made them smaller, cut out with a small jar dipped in flour. Will definitely teach my granddaughters how to make them when they come to visit. Whipped up my eggs and cheese, buttered and jellied my biscuits and had a grand time! I ate three and was super full. Will definitely make again. The recipe is added to the others on my fridge. Looks great. Can the biscuits be frozen after they are baked? Did anyone successfully make these with unsweetened coconut milk? My son is allergic to some treenuts including almonds. I’m allergic to pea and soy milk so while those are my normal go tos for him I can’t bake for the whole family with them. Will rice milk work for thise recipe? Hi Trianna! I think these really are best when made/baked the same day. But if I were you, I’d cut them, place them on a plate, and then let them come to room temp on top of the oven while it preheats. Bake as instructed. Report back! Fantastic, thanks for the recipe. This is the best recipe I have come across in a few years of trial and error. In all fairness to the other recipes it could just be me. The biscuits turned out great, thanks again. Please stop rating down a recipe you modified at your own peril! When followed to a T, which is simple as pie (or biscuit), they turn out beautiful. With my hot air oven they only required 8 mins and they were perfect. I used an unsweetened oat milk which is quite creamy so I used almost all of the milk mixture. Thanks for this recipe, lazy Sundays ahead will be better than before! These really are amazing! Thank you for an awesome recipe! Hi, I’m new to vegan baking and full disclosure I made some substitutions for ingredients I had (whole wheat flour, cashew milk, vegetable shortening instead of vegan butter). The texture of these biscuits is perfect, but mine have quite a strong aftertaste of baking soda. I don’t really think my subs would have caused this, but wanted to know if this has ever happened with yours? or if you had some ideas? Thanks! Hmm, it was likely changing up the ingredients that led to this flavor, because baking soda / powder shouldn’t affect the flavor too much. Hey there! What do you recommend I do to make a sweet version of these to use in a peach-thyme shortcake? Can I just add a little sugar? I saw your GF recipe but I don’t need GF. Thanks! Yes, that should work nicely! Fairly new to baking. Didn’t see that the cup of milk might not be entirely needed because it’s not mentioned until the end of that step. Had to add a bunch more flour to compensate. They still turned out okay though! I have made these twice, once with soy milk and once with flax milk. Both times were DELICIOUS. I used the earth balance “butter”, and my husband and 6 year old couldn’t tell the difference! They were only excited I made homemade biscuits haha. The first time I shaped them, the second time I didn’t, and they were great both times. I still painted them with fake butter and made a dent in the center with them all touching. Oh, wait, my husband decided to shape one using a gingerbread cookie cutter *eye roll* it held its shape surprisingly good!! Best biscuits I’ve ever had, if I do say so myself! We’re glad that your family enjoyed these biscuits, Krystal! I just made these, following the recipe except I used 1/2 cup whole wheat flour and the rest white. They are awesome with my mom’s strawberry freezer jam. Woot woot! Glad to hear that, Wendy! Amazing! I literally had to stop myself from eating the whole batch. Thanks for this easy to make YUMMY recipe. I wrapped them in foil overnight and heated them up the next day and they were just as good. Whoop! Glad you loved them! I made these subbing gluten free Bob’s Red Mill 1 to 1 Baking Flour- and I doubled the recipe using extra vegan butter milk (needed 2 2/3 cups total) along with doubling all ingredients, and I did not brush the biscuits with butter before baking… and they still came out amazing!!! Super moist and fluffy! I hade choices of: vegan butter and strawberry jam; and Nutella and banana, to top the biscuits. YUM!!! Yay! Thanks for sharing your recipe changes, Heidi! I have made these about 4 times. Absolutely Delicious! As a matter of fact, I founf out yesterday before I surprised my Signifcant Other with some hot biscuits, he was praying that I had made them. For those who get a really sticky, loose dough: flours, and baking, react differently in humidity. The more humid it is, the less liquid you will need, and more flour. The flour itself is affected by the humidity. If your flour has more moisture, you will need less liquid. And I always go by what Martha Stewart says: “make it cold, bake it hot”. Meaning, cold milk or liquid and cold butter (or butter sub). Then bake at a high temp. My first ever attempt at making biscuits! Thanks for the great recipe. They were good, but I may have overworked the dough. I’m a northerner and I just don’t have an inner southern soul ;) Will try again. Thanks, Dana!! We’re glad you enjoyed it! Yes, no need to overwork the dough! I’ve never baked a thing in my life and these were easy and seriously the best damn biscuits I’ve ever had. I make these biscuits all the time and no one can believe they are vegan! And they are SOOO easy! We’re thrilled that you love them, Jackie! Started with whole wheat flour & cold ghee, subbed V8 for almond milk & lemon juice, and added veggie bouillon for a savory biscuit. So going to make your pot pie recipe to go with these! Thanks for sharing your recipe changes! HOLY COW. When Dana says you won’t be able to tell the difference between these biscuits and non-vegan biscuits, she’s not kidding. These are AMAZING. They have an incredible texture (crisp on the outside, soft flaky inside) and a kind of pretzel-yeasty aftertaste. As someone who’s allergic to yeast, I loved that these just used the baking powder/soda. Thanks, Dana — you killed it! these were SO GOOD! fluffy, and well, just SO GOOD. i cheated and used real butter – but the lemon and almond milk worked fantastic! served them hot with honey and butter. I also added parmesan (i’d make a terrible vegan) and dry rosemary – delicious! thank you for sharing this excellent recipe. Can I use coconut oil as a butter? We haven’t tried and can’t say for sure, but if you do, report back! Good luck! I found this searching for a quick recipe for ‘vegan whole wheat dumplings’. I made soup yesterday, and it “wanted” dumplings in it, so I used a package of my son’s store-bought biscuits, knowing dumplings and biscuits are practically the same thing. They weren’t awful , but I knew I’d need to make my own to put into the leftover soup for today. They turned out pretty good, but I forgot I should’ve upped the baking powder to “fluff” the w/w flour, as I usually do. My tweaks: We’re almost out of Earth Balance, so I subbed coconut oil, and used flax milk for almond milk. I think next time, I will make the actual biscuits, but these worked for my dumplings. This was SOOOOO tasty and easy to follow! I can’t recommend this blog enough – your recipes are always a sure thing. Thanks so much! These are so amazing! However I’m trying to get away from Earth balance as they contain palm oil and in my opinion are not vegan like they claim: ( have you perhaps run into this issue? Trying to find a vegan butter that does not contain palm oil? I’ve been using them for years but am now trying to find an alternative. Any suggestions?? I can’t go without these amazing biscuits!! Hi Jessie! 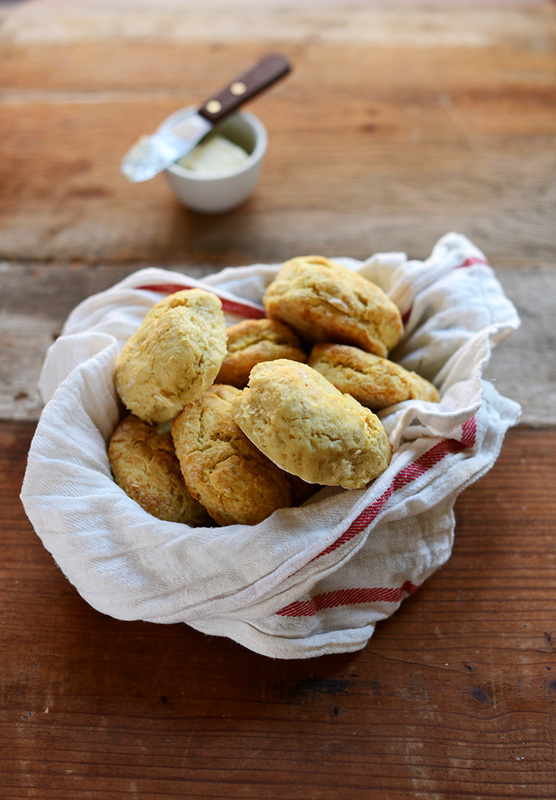 Check this newer biscuit recipe out, as we use coconut oil in this recipe! These look amazing! Can you substitute the all purpose flour for gluten free flour?? Hi Dana , can I use coconut flour instead of all purpose flour ? That won’t work, sorry. Try this recipe instead! Hi. I made these gluten free and vegan and they turned out amazing the first time! Is there any way to adapt this recipe to make it gluten free as well? Thanks you!! Hi Diana! 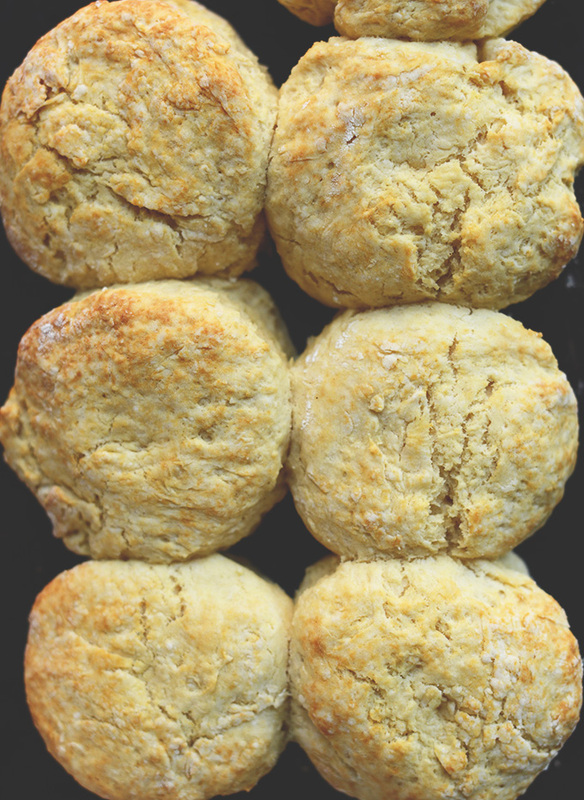 We do have a gluten-free biscuit recipe which may be of help to you? Now, you are using my kinda language. Bahahahahaha…….. THANK YOU for your true genius idea. These really are the Best Damn Vegan Biscuits EVER!!! I make them about every other week and freeze them! They are sooooo good!! Thank you for this recipe! Thank you for this recipe. I just made it and it was yummy. I did have to substitute soy milk for the almond milk as my son is allergic to almonds. I’m wondering if this could have caused my dough to be extremely slimy? I couldn’t form beautiful round shapes but instead just free formed them. 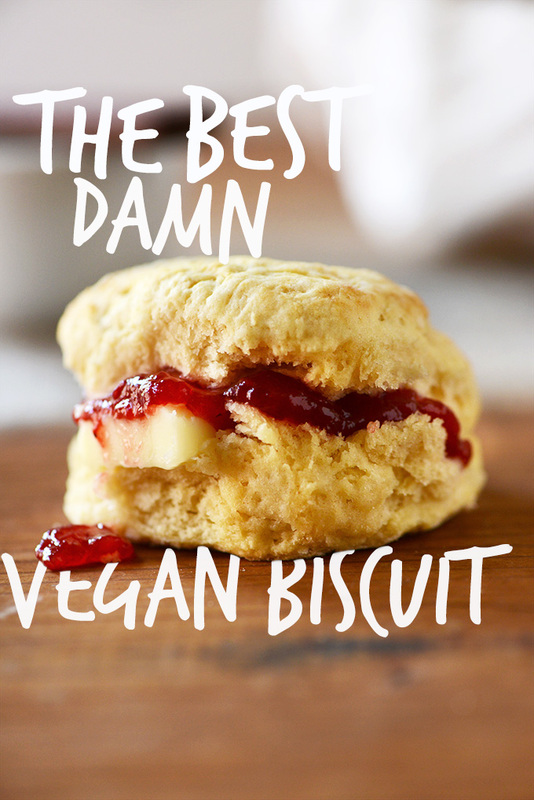 Agreed – Best Damn Vegan Biscuits. Thanks for sharing!!!! Followed exactly other than having to use some original soy milk rather than unsweetened because we needed biscuits NOW! So quick and easy and so, SO delicious!!!! QUESTION- I have removed all oil from my diet so I’m trying to do the Vegan Biscuits w/out the vegan butter-so far I’ve “cheated” and used it (YUMMY)but I’m dealing with a lot of inflammation (lupus/RA) and am improving w/o any oil or processed. Do you have ANY suggestion for a no oil/vegan butter w/biscuits? I have a feeling I’m going to have to cheat with this recipe (again-my daughter and I LOVE the Pot Pies-we just eliminate the oil w/onions-and it’s great bc it lasts for several days!). If anyone has any suggestions please throw them my way! Love the site btw…great great vegan cooking! I’m GF also (that’s an easy switch w/gf flour). Awesome Biscuits! I was making cabbage and veggie soup for dinner and didn’t have any dinner rolls or bread and then remembered my grandmothers delicious buttermilk biscuits. Quick internet search for a vegan version and I found this recipe. Quick, easy, and amazingly delicious! Perfect for this cold winters night. Thank you! I am an avid baker and amateur cook, so I read online recipes often. I have NEVER left a comment on an online recipe until now. The only thing I changed was adding just a pinch of salt to the melted butter that I brushed on the top. Otherwise, this is an excellent recipe the way it is. What about making the dough the night before? Have you done this? Feeling doubtful on the quality of the product. Hi Kelly! It should work to make the dough ahead of time! These were delicious, Dana. I wanted to double the recipe, so I used three cups of all-purpose flour and about 3/4-cup of whole wheat flour. I also added some dried rosemary into the batter and then sprinkled some additional rosemary on top before baking. I only needed about 3/4 of the almond buttermilk. I will definitely make these again. Thanks for the recipe. I made these and they are really good! These biscuits were amazing. Thank you. I never could make homemade biscuits until now. The only deviation was using almond vanilla milk and pink salt because that’s what I had. Great! These were amazing, I made them tonight my boyfriend could not stop eating them and my vegan skeptic mom even loved them. The only thing I did differently was adding a tablespoon of nutritional yeast and I used whole wheat flour. They were absolutely delectable. Definitely worth a try! Subbed coconut vinegar at ratio for the lemon. Omgoodness, just made these for visiting grandson and fiance` and they loved them. They are not vegan and wanted to serve them something they should like for breakfast. I have never made biscuits before and was apprehensive but these turned out great! They loved them as did we! I used half oat flour and half hard white spring wheat flour, earth balance and soy milk. Thanks so much for the wonderful recipe, Julie!! I made these tonight and though I forgot the leavening altogether in my excitement they tasted great. Didn’t look like much, but the flavor is reeeaaally good. So I’m going to try again with ALL of the ingredients. Definitely a keeper in my book. Hi, Dana! 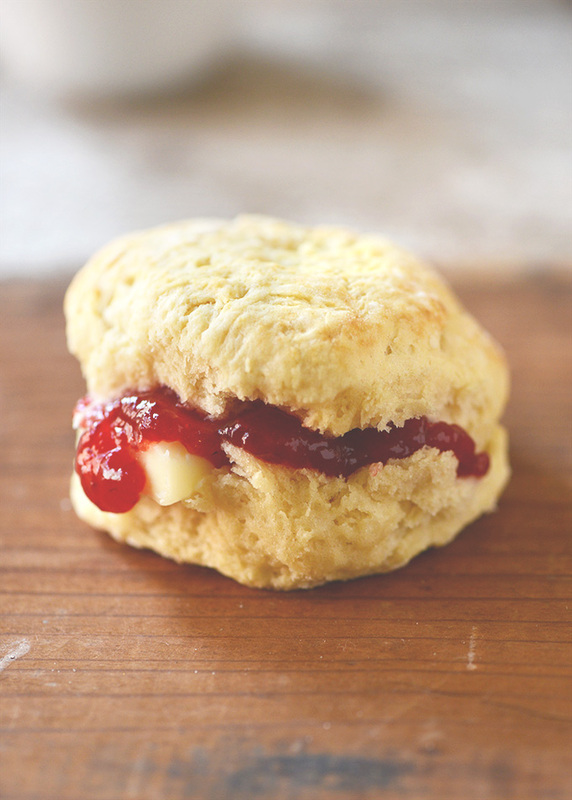 My favorite way to have biscuits, scones, etc are with clotted cream and jam and I was wondering if you’ve made any recipes for a vegan clotted cream? If not, are there any that you would recommend? Thank you so much! :) I love your work so, so much! I made them along with a savory seitan beefless stew on a cold November day for my hardworking, tired hubby. They are so delicious! Next time I will only leave them in the oven for 10-12 minutes, as they were a bit overdone for my taste. (I think I left them in too long.) But they were still absolutely scrumptious. Try them soaked in your stew like crackers if they’re overdone. AMAZING FLAVOR AND HEARTY TOO! Can these be made ahead of time up to the baking part? Could I use gluten free all purpose? Hi Julie! 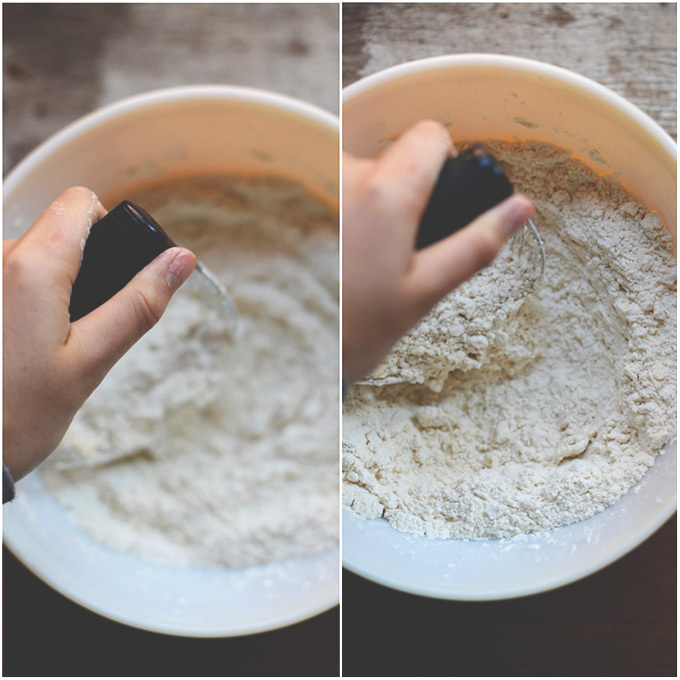 If you are wanting to make gluten free biscuits, I would follow this recipe! I’ve never made biscuits before and I gave these a go. I’m not vegan but only had almond milk in the house so that’s why I gave these a try. Holy crap. I’m typing this with buttery fingers and I swallow the last crumbs. Out of this world! Just made these biscuits for Thanksgiving and they did not disappoint! Super easy to make and they have great flavor and consistency. Thank you for this amazing recipe!!! Does I‎t matter if the almond milk is warm or cold? Hi Dana. I am making these tonight. But I would love to make them when my son and daughter-in-law come to visit because they, like me, are vegans. If I want to double the recipe, do I double all of the ingredients? Or are there some, like baking powder and soda, that I would just increase a little bit? Hi Linda! Just double all the ingredients! This looks awesome! Do you have a gluten free substitute for the bleached flour that you would recommend (rice flour, corn flour, chickpea flour, etc)? Hi! I would follow this recipe if you would like GF! This is the first vegan biscuit I’ve tried my hand at and it lives up to it’s name! I won’t be trying any other biscuit recipes. Buttery, flakey, moist, crunchy in all the right places… And pretty easy not to fudge up,which is saying a lot for someone like me in the kitchen! Don’t make the mistake I did of disregarding “you may not need all of it”. I guess the right amount would be more like 7/8 cup rather than 1 cup of almond milk. I ended up having to add a bunch more flour to offset the mistake, leading to overworking the dough a bit. Also, at the “turn it 7 times” stage, flour it a bit between turns or it will stick to everything. This was a hit! And super easy. I hadn’t used my oven in a year. But I made this for a dinner party. Everyone (even those who don’t self identify as vegan) loved them. I highly recommend this. So so good. OMG!! I just made these and seriously they are so light, fluffy and down right good! Wow! Hi Chelsea! You can use coconut oil, and others have tried using canola oil and had success! If you ever have a left over biscuit, I think they are great split and toasted and then adorned with whatever spread you like. I can justify peanut butter better because it is more than just fat. You can add jelly or jam to that. Or for lunch you could spread hummus or other sandwich spread. Thank you for this recipe! My family and I are living in France and we are unable to find biscuits and gravy, so this recipe has become a household favorite! Definitely a ” from back home” treat. We add nutritional yeast and garlic powder to ours and they turn out scrumptious! These are amazing for anyone! I have a couple of non vegan friends that have me make them a dozen at least once a month. I just pulled the biscuits out of the oven. I have never really had success making biscuits but these turned out great!!! They are soft and delicious. My husband even likes them. I’m gluten free. 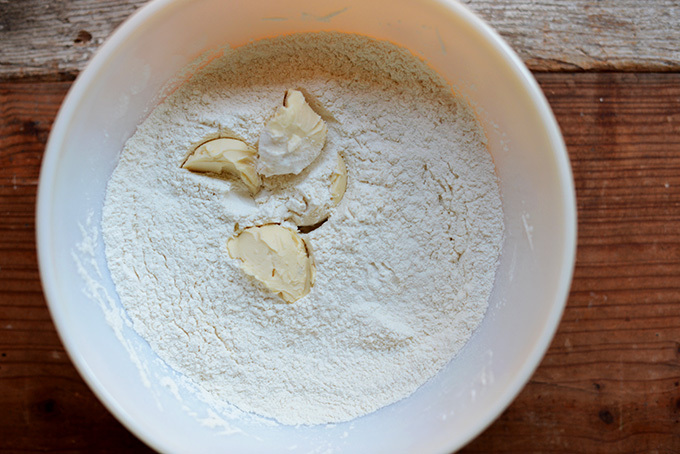 Have you ever tried tapioca flour or almond flour? Hi Angela! If you are wanting to make this recipe, here is the gluten free option! If I make these tonight but want to bake them tomorrow night so they are fresh for Thanksgiving dinner should I freeze the dough overnight and pull them out to defrost in the morning? I’ll be travelling via car all day tomorrow and will only be able to transport them in a cooler. I first came across this recipe when looking for vegan pot pies. I made the biscuits on Sunday and have made them twice since then… (it’s only tuesday ?). So addicting and easy to make! These were awesome! I didn’t have any vegan butter I I used 3 tbls coconut oil that I put in fridge till solid. Turned out great! This recipe is fantastic! The biscuits come out so fluffy and tender! And I love that I don’t have to make a special trip to the store for heavy cream (my go-to recipe for biscuits uses heavy cream… but I usually don’t have that on hand, but I always have almond milk!) Love how they came out and now I’m sending this recipe to all of my friends! These sound delicious! My son has an allergy to almonds. Do you know if I could substitute coconut milk instead? Hi Becca! That should work! These are simply the best biscuits I have ever eaten. 73 and from a family who made biscuits every morning, when I was growing up. Amazing, vegan or otherwise. Thank You. !!!!. I’ll be buying your recipe book, based on this alone. Also following your blog. Thank you!! I just made these and OMG! I already ate one with vegan butter and strawberry jam, even though the biscuits were supposed to be for dinner tonight with veggie soup. I changed a couple things from your recipe, but they were still perfect. I had soy milk instead of almond milk. I also used 1C whole wheat pastry flour and 1C all purpose flour. They are going to be my new favorite to make with all my vegan soups and stews; as well as breakfasts, snacks, you-name-it. Thanks again! This recipe lives up to its name! They ARE the best damn biscuits! Thank you for all efforts to share all these wonderful recipes. As I venture into a vegan diet, Im always delighted to try your recipes. Again, thank you and please continue to share!? Also, I used coconut butter this last time but I personally preferred the vegan butter recommended in the recipe. They still taste good. AND I whole heartedly recommended the mushroom gravy! Fabulous combo! The Bonb! When you made these with coconut butter, they turned out okay still? We are oil free right now, and can’t use non dairy butter. Is it ok to make the dough about an hour ahead and refrigerate? Hi Beth! We haven’t tried it, but it should work! Made this with almond flour, for the gluten free crowd. Pretty crumbly, but taste was great; my kids were all over these! Someday maybe I’ll give it a go with casava flour too. Thanks! Have made these umpteen times. Last time i shared with my nephew and his wife. They were impressed and their kids said they were ‘yummy’. Dana – all your recipes are amazing – b u t this damned one tops them. Thank you for your articulation with all the ‘to do’s and ‘to don’ts’ – v helpful to make them so awesome. Thank You!! I love and rely on Minimalist Baker recipes. I was reluctant to try these, though, because as a person of color, the tongue-in-cheek ‘urban speak’ was uncomfortable to read – I noticed that many carried it through in the comments, as well. My intent isn’t to hurt or shame – just putting my open heart out there, how awkward and uncomfortable it is, reading a biscuit recipe written like this. :) But – I couldn’t find a good vegan biscuit recipe and decided to wade through the “yo butter” and “fool” writing to make these, and of course, as always, the results were delicious. I felt the exact same way, Anne. I too am a person of color born in the South. Although I have traveled and do travel the world, some words and comments remain insensitive to the little brown girl in me. It is amazing what is lost when words are tossed around like recipes. Fortunately, the best ones (recipes and words) are the ones we learn(ed) as kids… which were never hidden behind poor humor and a lack of taste… pun intended. Happy Baking, Ann. Thanks for sharing your comments and thoughts. I/EYE acknowledge them and you. Passing on this recipe, because it is “my right” to do so. I was so psyched to see this recipe…I LIVE FOR BISCUITS. Any chance you would have a good result with gluten free flour as well. I am intolerant to Dairy, Gluten and Eggs. If yes, can you recommend what proportion of the various GF flours (or what brand of pre-made GF flour) works the best? I am not a fabulous baker and could use some expert advice on this!! Thanks!! Hi Whitney! We haven’t tried these gluten free yet, but you could try it with my GF blend! 1 1/2 cups brown rice flour, 1/2 cup potato starch, 1/4 cup tapioca flour, 1/4 cup white rice flour. Hope this helps! Is there a way to make it oil free? Wow, what an incredible recipe! I hope you still read comments because I want to tell how delicious they turned out. I am not a Vegan but I do keep kosher ( I can’t mix dairy and meat together). I was looking for a non dairy biscuit recipe and came across yours. I did reduce the salt to 1/2 tsp per other reviewers and dropped them with a large spoon onto a baking sheet rather than attempting to form with my hands. They came out perfect! Can’t wait to eat with my homemade peach preserves or smothered in gravy. YUM! Dana, thank you! I have been trying and failing to make (good) biscuits for at least a decade. As a kid, I once made it all the way from California to Montana eating only biscuits and gravy at every meal. At that age, I was too excited that my grandmother allowed my weird dietary behavior to notice that most of the truck stop biscuits and gravy were sub-par at best. As I matured, I became more discerning but no less fixated on that favorite comfort food. The first time I made this biscuit recipe I was nearly in tears of hungry joy. They really are perfect! I’ve been vegetarian for about two years now, and your mushroom gravy recipe was similarly appreciated. The only real hesitation I had about becoming vegetarian was the prospect of giving up what is arguably the heaviest, most delicious breakfast out there. So… five stars and hats off to you! One question: do you think the biscuits would freeze well? I’m tempted to try just in case it works; having a batch of these flaky beauties on hand would be oh-so-convenient. Hi! We haven’t tried freezing them but if you do, freeze before baking them. Once ready to bake take them out of the freezer and just set on the oven, covered, while the oven preheats and let them rest a bit. Love this recipe! I make it regularly for my husband. I double the recipe and make them bigger, and also add raisins or cranberries. My husband loves them, and thinks I’m a genius lol. Thank for the great recip! Okay so I normally never leave a review but I have to for these! I am in awe of how flaky and fluffy these turned out. I live in Charleston, SC which is biscuit central and these are the best I’ve had. No exaggeration. I subbed coconut oil for the butter and used homemade cashew milk and white whole wheat flour. My dough was very sticky so I thought I had completely messed it up but nope. Made the best breakfast biscuit and can’t wait to make another tomorrow! You are rockstar with this recipe! You go girl! The Best damn easiest quickest most delicious biscuits!!! If you are wondering if you can make these, Yes you can! I’ve recently had to go dairy and egg free for my dairy and egg sensitive baby, and you have been there every time I’m having a craving and feeling like there’s no way a “safe” version of something exists. These are absolutely perfect sprinkled with sanding sugar before baking and served with strawberries and cocowhip! “As in, serve them to your 80-year old grandmother who’s been making biscuits for centuries and she wouldn’t know the difference”. She might have made them for decades, but not centuries; or am I missing something? Other than that, I like what I see so far and will investigate further. Thanks! do you think these would work with spelt four? Hi Alice! Others have tested this, but check the other comments for tips! BEST EVER!! hands-down. my go-to biscuit for BnG, dinners, thanksgiving, etc… I would leave santa a plate of these! Hey I have another question can I make this without the lemon juice or is that really needed for it to work. You can probably use an equal amount of apple cider vinegar or even white vinegar and have it turn out fine. These are so amazing!! I’m allergic to almonds so I used coconut milk creamer (what I had in the house but I imagine they’d be really good with coconut milk) and they turned out perfectly! I have to make this! My husband and I used to LOVE going to Chick-Fil-A before he went vegan and recently he’s been loving on these meatless chicken nuggets and vegan cheese. If I do this right, I could make a vegan version of his favorite breakfast. This is, by far, the best vegan biscuit recipe I have tried. I can’t wait to do biscuits and gravy with these. I just made these, they’re okay but way too salty (maybe its an American thing?) and also not cooked properly on the inside. Next time I’d definitely adjust the salt and cooking times. Just made these to go along with some vegan strawberry shortcake, and these biscuits are so delicious! In love with them! i was wondering for the biscuit recipe what i could subsitute for baking soda and powder? i dont use vinegar, baking soda or powder. That’s hard, because those are the only leavening agents. Sorry I can’t help! hey I have a question do you roll it out by hand if not using a rolling pin before layering it. Could similar results be achieved with a gluten free flour such as brown rice flour? Hmm, not sure! Let me know if you give it a try! Oops, I forgot to rate this recipe. 5 damn stars, of course. Hi Dana, I just made your biscuit recipe. The Best Damn (Vegan) Biscuits! is absolutely right. This is the first batch of biscuits vegan or otherwise that I really felt came out as desired. Just wanted to thank you for this recipe. This was my first time to your site, but my wife says shes a frequent visitor. One thing that I noticed was that your recipe calls for 1 tbsp (7g) of baking powder. Because I also weigh ingredients I found that a tbsp of baking powder weighed 15g. This might mean there’s a typo in your recipe. Made them and they came out tasting a bit like baking soda… any suggestions? I hope I do not sound redundant, but has anyone tried this recipe with GF flour?? I have a SEVERE gluten/wheat allergy in my household. I would love to try this recipe. However, I do not want to get my hopes up too high that my biscuits would be light and fluffy. I am going to attempt to add dates to this recipe….I’m assuming it will work the same as date scones! Wish me luck!! I’ll report back. I used organic sprouted spelt flour and half the liquid (also used organic pasture raised ghee). They turned out wonderful! Thank you! 5-star recipe! So easy and delicious!! 5 stars! I am currently on a dairy restriction, so it was a special treat to have delicious biscuits! Thank you for the recipe! Hi there!! I just made these, and I am wondering what I did wrong! When I took them out of the oven they all just fell apart and tasted like sand! I purposely did a try out before Easter dinner for this reason haha…. Do you have any thoughts? Hi Emilie! I am sorry to hear that! Did you alter the recipe at all? It sounds like they needed more liquid to help them bind better. Can’t wait to make these! Quick question, for a substitute of all purpose which would you recommend; spelt, oat flour, whole wheat, white whole wheat, whole wheat pastry, etc? Thanks!! Dana, girl, you are a genius! I made these for breakfast this morning, subbing the lemon juice with ACV. They were so fluffy and good! They even stayed intact when I sliced one in half to add jelly. Every other vegan biscuit I’ve made would crumble. Even my omni mom/designated family cook gave me props! This recipe is the one; thanks so much for sharing it! Made these last night adding about 1/3 C chopped dill. A-MAZING! Thanks, Dana!! I replaced lemon juice with rice vinegar, almond milk with rice milk, and used spelt flour and ghee. I paired it with strawberry compote. I hope that you receive a reply. I just asked the same question as I did not read all of the comments. I hope that GF flour works! Guess one of us will have to give it a go. I hope this will be helpful. I made this recipe and followed directions explicitly. By using 272 grams of flour. Adding approximately 1/4 cup at at time. I found I only needed 3/4 cup of the almond milk, lemon mixture. I did not end up with very sticky dough, probably because I did not over moisturize the mixture. Per directions, I gently flattened (to about 1″ thick) and folded the moistened dough, on a floured surface, about 6 times. I did NOT knead it. The biscuits were the best biscuits I’ve ever made, in terms of rise, flakiness, etc. I have not tried this with GF, flour yet. When my teenagers don’t ask if this is one of my dairy free recipes – that is a win! Thanks for a great recipe!! I see filling my midnight cravings by topping them with jam and cream in my future! Very good and easy! You’re tips were very helpful. These are absolutely delicious, and simple to make! Thank you for the recipe. Just left a long comment regarding your sweet potato and kale breakfast hash, which I had this morning with these biscuits. I have always loved biscuits but could not find and acceptable vegan recipe until now. Have enough hash and biscuits for another breakfast. Thank you for these recipes. Yay. I was wanting to make scones so using this recipe, I added some sugar and craisins to the basic recipe. I needed more flour as it was too moist with all the milk added so i kneaded in flour until the proper consistency. Rolled out and cut . sprinkled a little sugar on top. baked accordingly. Really turned out great. Had to holler at my husband to stop eating them as he doesn’t have food allergies and I made them for myself. Can these be made without the butter? Would it be possible to use coconut milk for the earth balance vegan butter? Trying to refrain from using items with palm oil. Thanks! I made these with Bob’s Red Mill gluten free flour and they are fantastic! I didn’t need all of the milk/lemon juice mixture. I will probably use about 1/4 c. more of gluten free flour to use all of the “buttermilk” and get another biscuit out of the recipe. So delicious! I just made your Best Damn Vegan Biscuits and they are the best!!!!! I’m right-handed and broke my wrist and it was a bit difficult for me to do but I was determined and I am so glad I did. I made the veggie pot pie filling and put the biscuits over it. Oh so good! Ah-amazing biscuits! I am currently eating my second. The only change I made was using half whole wheat flour and half bread flour since those are what I had. Ermahgerd! It’s going to take so much discipline not to eat them all! Thank you Dana! Omg. I made these for dinner tonight. Forget the main course, I wanted the plate of these biscuits. They are soooo good. And they’re as good as the old fashion buttermilk biscuits! Thanks so much for this recipe!! I used kamut flour – and other substitutions, and it did not work all that well. It was okay, not great. Kamut is a type of wheat which has less gluten. It tastes like whole wheat, but with a somewhat stronger flavor. – I substituted coconut oil for vegan butter. Seemed to work fine. No noticeable coconut flavor. – I substituted Kirkland soy milk and apple cider vinegar for almond milk with lemon juice. The biscuits were a tiny bit gritty, and crumbly, no real problem. But the kamut flavor is not really what I was looking for. I will try again with Jeanne’s flour mix, and with Pamela’s bread mix. Tried again. But this time used Jeanne’s GF flour instead of kamut. Came out much better. I cut the recipe in half, and made four biscuits in a convection toaster oven. I have made these biscuits at least a dozen times. They are so amazing. We literally stopped eating brunch out at our favorite local restaurant because we’d rather just eat these. Thanks for sharing! I noticed the comments are from 2013. I read through quite a few of them to find out about making them Gluten-free. There were mixed reviews. I’m wondering if they have been gluten-free perfected yet!? I am wondering the same thing! Have you tried Nancy? No, I haven’t tried them yet Kelly. I’m tempted though, but get frustrated when they don’t turn out. Nancy, I feel you! I am making them now. I’ll report back with the results ? Nancy, I had success!!! 2 cups Bob’s Red Mill AP flour plus 2 teaspoons of xanthan gum. I have made the original recipe numerous times and was making GF for a friend with celiac. The GF version tastes equally as delicious as there gluten-y counter part! The name is no lie these were amazing I just had your Vegan Shepard Pie for dinner and made these for tomorrow but so much for that cause I just ate like 3 and my family is eating then too they are so so amazing!!!!! Hi! Can I make the dough ahead of time and put it in the fridge? I’d like to make it at night so I can just throw them in the oven in the morning. Will that impact their quality? Thanks! Can you use self rising flour and cashew milk for this recipe? Hi! I haven’t tried it so I can’t say 100% but that should work with some tweaking of the recipe. If you use self rising flour in place of unbleached all-purpose flour, you’re likely going to want to leave out the baking soda! Let me know how it goes! I made these with all purpose pancake and cake GF flour. They were amazing. My sis in law said I should get an award. LoL. Now, I’ll see how they last until the am! Thank you for a great, very simple, recipe! I just can’t bring myself to bake anything with white flour. I am sure it is tasty. Fantastic recipe! I was really impressed with the texture! If I hadn’t baked these myself, I never would have guessed they were vegan. I made these and with the gravy recipe you also posted and they are delish! I ate 3 in one sitting! Thanks for bringing biscuits back into my life! Next time I’ll try with gluten free baking flour! It worked very well for me!!! Just made the vegan biscuits and they came out delectable! Made flax seed milk in the Vita mix for the ‘buttermilk’ which worked a treat. The dough was moist and flexible and easy to work. Thanks for a great recipe; your blog is super. Just made these vegan biscuits for supper tonight. Made exactly as recipe stated and they turn out perfect. Made 9 big biscuits. Fluffy on the inside and crispy on the outside. My new biscuit recipe. Sorry, but I just can’t seem to get past the unnecessary swear word in the description! Might look through this site if the foul language was eliminated! We made these for Christmas dinner last night, along with the Garlic mac n’ cheese, caulk mashed potatoes and mushroom gravy, pot pies, pomegranate margaritas and one of your bean soups. :) These biscuits were amazing. Everyone loved them and they were easier to make than I anticipated. I’m NOT a cook! lol. Everything we made turned out great, minus the mac n cheese. I think I just can’t get down with the nutritional yeast… I’ve tried and tried but it’s just the same as cheese! Still no cheese for me, but I’m good without the nutritional yeast substitute as well! Lol. Thank you for all the great vegan recipes! This is my go-to biscuit recipe. These biscuits are delicious. I make them with coconut oil instead of vegan butter. Definitely: NO NEED TO overKNEAD. The less you handle the dough, the fluffier they come out. This was my first time making biscuits, vegan or otherwise and they came out perfect for our Christmas dinner! The recipe was clear and very easy to follow too! I made these with 100% white whole wheat flour and they were very good. Probably not as fluffy as the original, but my husband, who is a biscuit connoisseur, had no complaints! Have you tried making the dough ahead of time and then storing in the fridge overnight? Id love to be able to wake up to fresh biscuits in the morning. I think that would work, but I haven’t tried it! It seems like a lot of people have had some issues with making these gluten free. I made them tonight and thought I’d share. I used: 1 cup buckwheat flour, 1 cup gf all purpose flour, 1/2 – 1 tsp. anthem. m. gum, and kept everything else the same. They turned out great! Disclaimer: Buckwheat flour has a strong taste and these won’t taste like your “grandma’s biscuits” if you make them the way I suggested. They’re still great though! These just came out of the oven! I always like to bake a new recipe just as written the first time, so if something goes wrong, I know it’s not my alterations. However, since so many had commented on the salty taste when they used salted butter and since I was using a (homemade, vegan, from coconut oil) salted butter, I used about 3/8 teaspoon of salt instead of the called-for amount. I also used a smidgen less baking powder since so many others commented on a baking powder taste. Wow, are they ever good! My Southern mother (English/Irish stock) made homemade biscuits with each and every meal as did her mother before her. She would have approved of these although she would have turned up her nose at cutting out biscuits–she formed a well in the flour/fat mixture and then poured in enough milk/buttermilk to get started forming the first few biscuits, plopped them in the pan, and repeated the process until she’d used up all the flour mixture. I may try that for my next batch, but I never matched her ability to make smooth-topped biscuits by that method. Mine always looked like a craggy rock, although they tasted good! With this batch today, my last couple of biscuits had a bit of a tough crust, but I know that’s because I reformed them to cut out the last few after I had cut the first five or six, so I obviously slightly overworked that last bit of dough. Mother’s method avoided that pitfall. Thank you for giving me back biscuits . . . and memories! I was seriously craving some cinnamon raisin bread this morning. So I made these biscuits and addded 1/3 cup of raisins and a TBS of cinnamon. Delicious! Definitely hit the spot! Love your recipes!! How do you think the recipe would come out using Spelt flour? I’m gluten free but can tolerate Spelt. Thanks for all the yummy recipes I can make! These are my go to- easy, delicious, bisquits that are all I make now. I’ve made them close to ten times now. I normally do not have lemon juice, so I add 1 Tbs of white vinegar to my “milk”- normally flax, and it works just fine. They turn out every time. Thanks a bunch for all your recipes. I am more than impressed with the ones I try :D Honesty have never made a bad recipe from you. I do not have vegan butter, could I use coconut oil instead? Really want to try these! See the comments, several people have had success with that! great! I’ll let you know how it goes. Also, do you think I can use a ruber muffin mold for these? Sure, but I wouldn’t recommend it.